The vision to bring Catholic radio to the Raleigh area was conceived in 2007 and the first meeting was held in November at the home of Keith and Cecelia Flanary. By 2008, and under the spiritual direction of Msgr. John Williams, another group from St. Joseph’s began striving towards the same goal. These two groups merged under the name of Divine Mercy Radio (DMR). DMR became an EWTN Global Catholic Radio Affiliate and a member of the Catholic Radio Association. With guidance from Jim Wright, president of Holy Family Communications in Buffalo, NY, DMR negotiated the 5pm hour of air time M – F with Curtis Media Group and began broadcasting on December 8, 2008, the Feast of the Immaculate Conception. Over the next nine months, DMR carried the best of Catholic Answers Live every Monday through Thursday, with the Friday broadcast, known as Local Fridays, providing an opportunity to air content recorded at Ignited By Truth Conferences, the Bishops Series on Bioethics, and NFP programs. DMR left the airwaves on August 29, 2009. Soon the DMR board turned its attention towards purchasing a full-power station and began raising money in earnest for this venture. In August of 2011, an AM station in Durham became available. However, in support of the new Cathedral, and in obedience to the Bishop’s general request to abstain from soliciting funds, DMR declined the option to purchase. In 2013, the FCC opened a window for local non-profits to apply for Low-Power FM stations. DMR applied for a station of its own and simultaneously approached other non-profit Catholic organizations in the Raleigh area to follow suit. When the FCC window closed, eight Catholic apostolates had submitted their applications. On October 13, 2015 DMR brought up Raleigh’s first full time Catholic radio station – WFNE on 103.5 FM in Wake Forest. On November 1, 2017, DMR’s 2nd full time FM station WSHP in Cary on 103.3 FM went on the air. Divine Mercy Radio’s present effort is the purchase of the full power station WETC broadcasting on 540AM. This station covers one-fourth of North Carolina and reaches 4 million people. The primary source of our programming is EWTN and Ave Maria Radio. 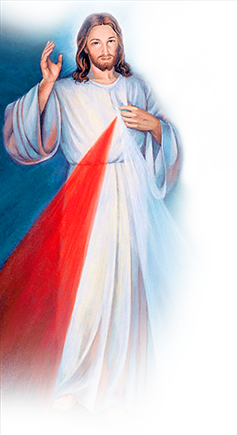 The Divine Mercy Chaplet every day at 3pm led by Catholic grade school students.